$99 per day | $59 with Inflatable Rental! Cool Down Treat San Diego Style! SOOOO COOL! The perfect treat to cool everyone down on those warm San Diego days. All you need to add is ICE! How COOL is that? Includes 60 serving cones and 2 flavored syrups: 1 Blue Raspberry and 1 Red Cherry. ICE NOT INCLUDED. 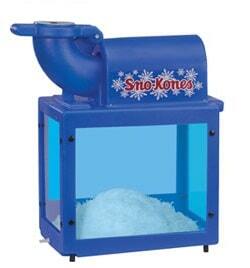 We recommend 1/2lb of regular ice for each snowcone. Need an Ice Chest? Check out our Large Cooler! Includes: Syrup/Cones for 50 servings. Additional 50 serving packs are $15. Ice not included. Every 50 servings requires approximately 25lbs of bagged ice.